At least 42 people have died in the Chinese city of Xiamen following a bus fire, according to state media. The incident happened during Friday's evening rush hour at about 18:30 local time (10:30 GMT). More than 30 other people were injured after a fire broke out in the rear of the bus, officials told the BBC. There is no word on the cause. The bus was from Xiamen's rapid transport system, in which buses run on elevated tracks above the city centre. 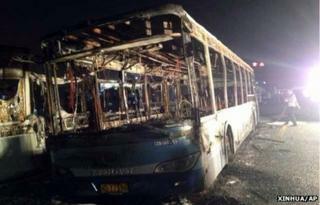 Photographs on Xinhua's website showed flames coming from an elevated section of track, and the burnt-out wreckage of a bus. Other pictures posted on social media show injured survivors with burns and blood-stained clothing. Xiamen is in Fujian province in south-east China and has a population of more than 3m. Its express bus system was built in 2008, and buses are reportedly very busy at rush hour. A local official who gave his name as Sun told Xinhua there were "bodies piled up in the bus".